While manufacturers can use either titanium sheeting or titanium plates in their operation processes, titanium plates are typically used for larger quantities and products. Titanium plates are made from ore which has already been fabricated and reduced from its natural mineral depository form. As titanium does not occur in its pure form in nature, the primary fabrication process is difficult and can be costly. Mineral deposits containing titanium are first refined to titanium tetrachloride and then reduced with magnesium. A highly porous bulk, or “sponge”, is produced from this which is then melted into titanium plates, ready for secondary fabrication. 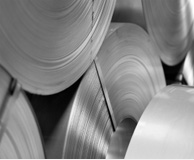 In addition to plates, titanium is also melted into billets, strips, bars, wire and tubing in order to be shipped or transported to manufacturing facilities. Titanium is a popular material choice for many applications as it offers superior strength, rigidity, and lightness compared to other metals. Equal to steel in strength, titanium is half of steel’s density and has excellent corrosion resistance. Due to these properties, titanium offers what is ultimately a cost-effective solution for many uses despite its initial high cost output. As titanium can hold the same amount of strength as copper, steel, brass or aluminum with only half the material volume, it can be used in lower quantities to achieve the same task. Since titanium is resistant to acid, oxygen, chloride and salt corrosion, titanium parts also result in much lower maintenance and a longer product life. Various titanium alloys are being used for an ever-widening array of applications. Aquarium, naval and other saltwater industries often use titanium for underwater parts due to its resistance to erosion, stress, microbiological corrosion and pitting. Because it is such a lightweight, high strength material, titanium is used in the automotive industry for valve springs, rocker arms, connecting rods, exhaust systems, drive shafts, steering gear and other parts. Racing cars specifically use titanium to increase vehicular speed. Surgical and dental industries use titanium instruments to decrease the chance of allergic metal reactions, and many kinds of prosthesis or bone splints and implants are manufactured from pure titanium, which does not contaminate or corrode in the body. The aerospace industry uses titanium quite extensively for jet engines, missiles and spacecrafts. Other uses for titanium include semiconductor and battery wires, chemical and petroleum handling, agri-food, orthopedics and sporting goods equipment. Once processed into an ore, titanium is relatively easy to fabricate and extremely useful, which is why many industries choose titanium even at a higher cost. Titanium Plate Titanium plates are blocks of pure form titanium metal that are thicker than 0.25 inches and are prepared to be used in secondary fabrication processes.